More from the DRESS LIKE A MUM beauty and make-up pro Tahira. Here she gives us her Top Three Balms - perfect for when its cold outside. 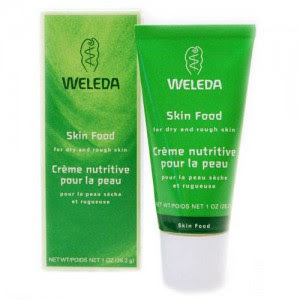 Weleda skin food: This all purpose all rounder is like a very rich lotion or hand cream. It is excellent for all sorts of dry and rough skin. I use it on hands, heels, knees and elbows, feet, cuticles and on legs and arms on photo-shoots for a lovely glow. I sometimes even apply it under makeup if my client has very dry skin. If you want to use it on the face, apply a bit on your hands, warm by rubbing together then pat on the face. Then use a single ply of tissue or blot sheets to remove any excess oils. Bert's Bees Beeswax Lip Balm: This semi matte balm has a lovely minty tingle and a smooth waxy texture, great for healing cracked lips without too much shine, good for the boys too. It comes in an a small (hard to open) tin or a little stick. Beeswax has many protective and nourishing properties, so you can also apply it to your skin if going out in the cold, or to the end of your nose if you have a cold... though the mint may make it tingle a little. Egyptian Magic: This funny little pot of wonder is a combination of beeswax, olive oils honey, propolis and pollen. It is solid in the pot but quickly melts to an oil if you warm it on the skin. It is recommended for all sorts of uses and I love how it absorbs quickly and leaves the skin soft. I have been using it as a lip balm around the house and just dabbing it on wherever I feel I need it.